CIDRAP Editor’s Note: Today’s commentary was submitted to CIDRAP by the authors, who are national experts on respiratory protection and infectious disease transmission. In May they published a similar commentary on MERS-CoV. Dr Brosseau is a Professor and Dr Jones an Assistant Professor in the School of Public Health, Division of Environmental and Occupational Health Sciences, at the University of Illinois at Chicago. The minimum level of protection in high-risk settings should be a respirator with an assigned protection factor greater than 10. A powered air-purifying respirator (PAPR) with a hood or helmet offers many advantages over an N95 filtering facepiece or similar respirator, being more protective, comfortable, and cost-effective in the long run. We strongly urge the US Centers for Disease Control and Prevention (CDC) and the World Health Organization (WHO) to seek funds for the purchase and transport of PAPRs to all healthcare workers currently fighting the battle against Ebola throughout Africa—and beyond. These statements are based on two lines of reasoning. The first is that no one located at a distance from an infected individual has contracted the disease, or the converse, every person infected has had (or must have had) “direct” contact with the body fluids of an infected person. This reflects an incorrect and outmoded understanding of infectious aerosols, which has been institutionalized in policies, language, culture, and approaches to infection control. We will address this below. Briefly, however, the important points are that virus-laden bodily fluids may be aerosolized and inhaled while a person is in proximity to an infectious person and that a wide range of particle sizes can be inhaled and deposited throughout the respiratory tract. Although there are some important barriers to the use of respirators, especially PAPRs, in developing countries, healthcare workers everywhere deserve and should be afforded the same best-practice types of protection, regardless of costs and resources. Every healthcare worker is a precious commodity whose well-being ensures everyone is protected. If we are willing to offer infected US healthcare workers expensive treatments and experimental drugs free of charge when most of the world has no access to them, we wonder why we are unwilling to find the resources to provide appropriate levels of comparatively less expensive respiratory protection to every healthcare worker around the world. How are infectious diseases transmitted via aerosols? Medical and infection control professionals have relied for years on a paradigm for aerosol transmission of infectious diseases based on very outmoded research and an overly simplistic interpretation of the data. In the 1940s and 50s, William F. Wells and other “aerobiologists” employed now significantly out-of-date sampling methods (eg, settling plates) and very blunt analytic approaches (eg, cell culturing) to understand the movement of bacterial aerosols in healthcare and other settings. Their work, though groundbreaking at the time, provides a very incomplete picture. Early aerobiologists were not able to measure small particles near an infectious person and thus assumed such particles existed only far from the source. They concluded that organisms capable of aerosol transmission (termed “airborne”) can only do so at around 3 feet or more from the source. Because they thought that only larger particles would be present near the source, they believed people would be exposed only via large “droplets” on their face, eyes, or nose. Modern research, using more sensitive instruments and analytic methods, has shown that aerosols emitted from the respiratory tract contain a wide distribution of particle sizes—including many that are small enough to be inhaled.5,6 Thus, both small and large particles will be present near an infectious person. The chance of large droplets reaching the facial mucous membranes is quite small, as the nasal openings are small and shielded by their external and internal structure. Although close contact may permit large-droplet exposure, it also maximizes the possibility of aerosol inhalation. As noted by early aerobiologists, liquid in a spray aerosol, such as that generated during coughing or sneezing, will quickly evaporate,7 which increases the concentration of small particles in the aerosol. Because evaporation occurs in milliseconds, many of these particles are likely to be found near the infectious person. The current paradigm also assumes that only “small” particles (less than 5 micrometers [mcm]) can be inhaled and deposited in the respiratory tract. This is not true. Particles as large as 100 mcm (and perhaps even larger) can be inhaled into the mouth and nose. Larger particles are deposited in the nasal passages, pharynx, and upper regions of the lungs, while smaller particles are more likely to deposit in the lower, alveolar regions. And for many pathogens, infection is possible regardless of the particle size or deposition site. It’s time to abandon the old paradigm of three mutually exclusive transmission routes for a new one that considers the full range of particle sizes both near and far from a source. In addition, we need to factor in other important features of infectivity, such as the ability of a pathogen to remain viable in air at room temperature and humidity and the likelihood that systemic disease can result from deposition of infectious particles in the respiratory system or their transfer to the gastrointestinal tract. We recommend using “aerosol transmissible” rather than the outmoded terms “droplet” or “airborne” to describe pathogens that can transmit disease via infectious particles suspended in air. Is Ebola an aerosol-transmissible disease? We recently published a commentary on the CIDRAP site discussing whether Middle East respiratory syndrome (MERS) could be an aerosol-transmissible disease, especially in healthcare settings. We drew comparisons with a similar and more well-studied disease, severe acute respiratory syndrome (SARS). For Ebola and other filoviruses, however, there is much less information and research on disease transmission and survival, especially in healthcare settings. What do we know about Ebola transmission? On the basis of epidemiologic evidence, it has been presumed that Ebola viruses are transmitted by contaminated hands in contact with the mouth or eyes or broken skin or by splashes or sprays of body fluids into these areas. Ebola viruses appear to be capable of initiating infection in a variety of human cell types,13,14 but the primary portal or portals of entry into susceptible hosts have not been identified. Some pathogens are limited in the cell type and location they infect. Influenza, for example, is generally restricted to respiratory epithelial cells, which explains why flu is primarily a respiratory infection and is most likely aerosol transmissible. HIV infects T-helper cells in the lymphoid tissues and is primarily a bloodborne pathogen with low probability for transmission via aerosols. Ebola virus, on the other hand, is a broader-acting and more non-specific pathogen that can impede the proper functioning of macrophages and dendritic cells—immune response cells located throughout the epithelium.15,16 Epithelial tissues are found throughout the body, including in the respiratory tract. Ebola prevents these cells from carrying out their antiviral functions but does not interfere with the initial inflammatory response, which attracts additional cells to the infection site. The latter contribute to further dissemination of the virus and similar adverse consequences far beyond the initial infection site. In still air, 3-mcm particles can take up to an hour to settle. With air currents, these and smaller particles can be transported considerable distances before they are deposited on a surface. There is also some experimental evidence that Ebola and other filoviruses can be transmitted by the aerosol route. Jaax et al24 reported the unexpected death of two rhesus monkeys housed approximately 3 meters from monkeys infected with Ebola virus, concluding that respiratory or eye exposure to aerosols was the only possible explanation. Altogether, these epidemiologic and experimental data offer enough evidence to suggest that Ebola and other filoviruses may be opportunistic with respect to aerosol transmission.28 That is, other routes of entry may be more important and probable, but, given the right conditions, it is possible that transmission could also occur via aerosols. Facemasks, however, do not offer protection against inhalation of small infectious aerosols, because they lack adequate filters and do not fit tightly against the face.1 Therefore, a higher level of protection is necessary. Identify the organism’s risk group (1 to 4). Risk group reflects the toxicity of an organism, including the degree and type of disease and whether treatments are available. Ebola is in risk group 4, the most toxic organisms, because it can cause serious human or animal disease, is easily transmitted, directly or indirectly, and currently has no effective treatments or preventive measures. Identify the generation rate. The rate of aerosol generation reflects the number of particles created per time (eg, particles per second). Some processes, such as coughing, create more aerosols than others, like normal breathing. Some processes, like intubation and toilet flushing, can rapidly generate very large quantities of aerosols. The control banding approach assigns a qualitative rank ranging from low (1) to high (4) (eg, normal breathing without coughing has a rank of 1). Identify the level of control. Removing contaminated air and replacing it with clean air, as accomplished with a ventilation system, is effective for lowering the overall concentration of infectious aerosol particles in a space, although it may not be effective at lowering concentration in the immediate vicinity of a source. The number of air changes per hour (ACH) reflects the rate of air removal and replacement. This is a useful variable, because it is relatively easy to measure and, for hospitals, reflects building code requirements for different types of rooms. Again, a qualitative ranking is used to reflect low (1) versus high (4) ACH. Even if the true ventilation rate is not known, the examples can be used to select an appropriate air exchange rate. Identify the respirator assigned protection factor. Respirators are designated by their “class,” each of which has an assigned protection factor (APF) that reflects the degree of protection. The APF represents the outside, environmental concentration divided by the inside, facepiece concentration. An APF of 10 means that the outside concentration of a particular contaminant will be 10 times greater than that inside the respirator. If the concentration outside the respirator is very high, an assigned protection factor of 10 may not prevent the wearer from inhaling an infective dose of a highly toxic organism. Two examples follow. These assume that infectious aerosols are generated only during vomiting, diarrhea, coughing, sneezing, or similar high-energy emissions such as some medical procedures. It is possible that Ebola virus may be shed as an aerosol in other manners not considered. Caring for a patient in the early stages of disease (no bleeding, vomiting, diarrhea, coughing, sneezing, etc). In this case, the generation rate is 1. For any level of control (less than 3 to more than 12 ACH), the control banding wheel indicates a respirator protection level of 1 (APF of 10), which corresponds to an air purifying (negative pressure) half-facepiece respirator such as an N95 filtering facepiece respirator. This type of respirator requires fit testing. Caring for a patient in the later stages of disease (bleeding, vomiting, diarrhea, etc).If we assume the highest generation rate (4) and a standard patient room (control level = 2, 3-6 ACH), a respirator with an APF of at least 50 is needed. In the United States, this would be equivalent to either a full-facepiece air-purifying (negative-pressure) respirator or a half-facepiece PAPR (positive pressure), but standards differ in other countries. Fit testing is required for these types of respirators. The control level (room ventilation) can have a big effect on respirator selection. For the same patient housed in a negative-pressure airborne infection isolation room (6-12 ACH), a respirator with an assigned protection factor of 25 is required. This would correspond in the United States to a PAPR with a loose-fitting facepiece or with a helmet or hood. This type of respirator does not need fit testing. Healthcare workers have experienced very high rates of morbidity and mortality in the past and current Ebola virus outbreaks. A facemask, or surgical mask, offers no or very minimal protection from infectious aerosol particles. As our examples illustrate, for a risk group 4 organism like Ebola, the minimum level of protection should be an N95 filtering facepiece respirator. This type of respirator, however, would only be appropriate only when the likelihood of aerosol exposure is very low. For healthcare workers caring for many patients in an epidemic situation, this type of respirator may not provide an adequate level of protection. For a risk group 4 organism, any activity that has the potential for aerosolizing liquid body fluids, such as medical or disinfection procedures, should be avoided, if possible. Our risk assessment indicates that a PAPR with a full facepiece (APF = 50) or a hood or helmet (APF = 25) would be a better choice for patient care during epidemic conditions. We recognize that PAPRs present some logistical and infection-control problems. Batteries require frequent charging (which requires a reliable source of electricity), and the entire ensemble requires careful handling and disinfection between uses. A PAPR is also more expensive to buy and maintain than other types of respirators. 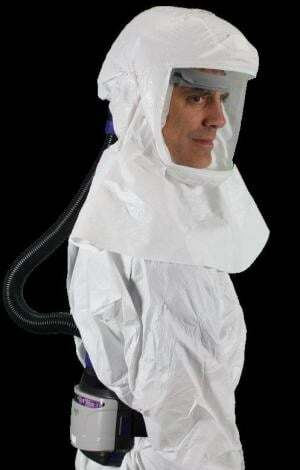 On the other hand, a PAPR with a loose-fitting facepiece (hood or helmet) does not require fit testing. Wearing this type of respirator minimizes the need for other types of PPE, such as head coverings and goggles. And, most important, it is much more comfortable to wear than a negative-pressure respirator like an N95, especially in hot environments. A recent report from a Medecins Sans Frontieres healthcare worker in Sierra Leone30 notes that healthcare workers cannot tolerate the required PPE for more than 40 minutes. Exiting the workplace every 40 minutes requires removal and disinfection or disposal (burning) of all PPE. A PAPR would allow much longer work periods, use less PPE, require fewer doffing episodes, generate less infectious waste, and be more protective. In the long run, we suspect this type of protection could also be less expensive. Patients and procedures generate aerosols, and Ebola virus remains viable in aerosols for up to 90 minutes. All sizes of aerosol particles are easily inhaled both near to and far from the patient. Crowding, limited air exchange, and close interactions with patients all contribute to the probability that healthcare workers will be exposed to high concentrations of very toxic infectious aerosols. Ebola targets immune response cells found in all epithelial tissues, including in the respiratory and gastrointestinal system. Experimental data support aerosols as a mode of disease transmission in non-human primates. Risk level and working conditions suggest that a PAPR will be more protective, cost-effective, and comfortable than an N95 filtering facepiece respirator. We thank Kathleen Harriman, PhD, MPH, RN, Chief, Vaccine Preventable Diseases Epidemiology Section, Immunization Branch, California Department of Public Health, and Nicole Vars McCullough, PhD, CIH, Manager, Global Technical Services, Personal Safety Division, 3M Company, for their input and review.